Day and night runners for the stable on Friday as Bianco Nuovo heads to Geelong and Touch A Cloud is under lights at Cranbourne. Bianco Nuovo runs in the first race, the Maiden Plate over 2200m where he will be ridden by Rhys McLeod and jump from barrier two. The son of Artie Schiller has improved as he has stepped up in trip and last start finished a close second at Warrnambool over 1700m. Mike Moroney is expecting the extra distance of his race on Friday to suit even further. “We’ve always had a decent opinion of him and he’s improving with racing,” Moroney said. “His last start was excellent - he just got left in front a bit too soon and was left a sitting target for the winner. Touch A Cloud (pictured) is in race three at Cranbourne, the 3YO Fillies Maiden Plate over 1400m with Jordan Childs to ride and jump from barrier four after scratchings. 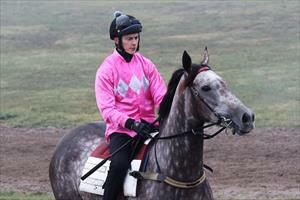 The daughter of Glass Harmonium pleased with third on debut over 1300m at Cranbourne last month. “She’s come out of her first run really well and continues to progress,” Moroney said. “I’ve always thought she will be better over a bit further so it will be interesting to see how she copes tonight.